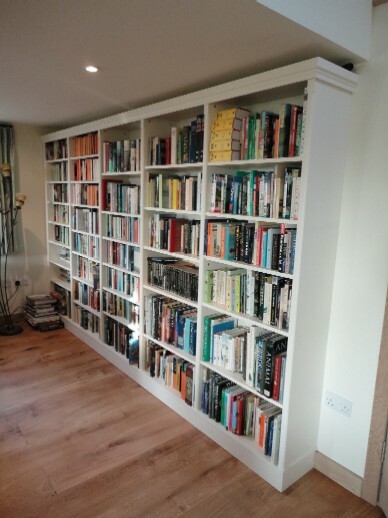 This bookcase unit was commissioned by Mr and Mrs W. from Wye in Kent to fill the wall space of a newly converted cottage. The piece measures 2.075m high x 3.5m x 0.305m deep, made in 5 sections with totally adjustable shelving. The durable spray paint finish was colour matched to Little Green Paint Companies White Lead No74 therefore no hand painting was needed to complete the piece after installation. Fully fitted five section bookcase in painted finish.